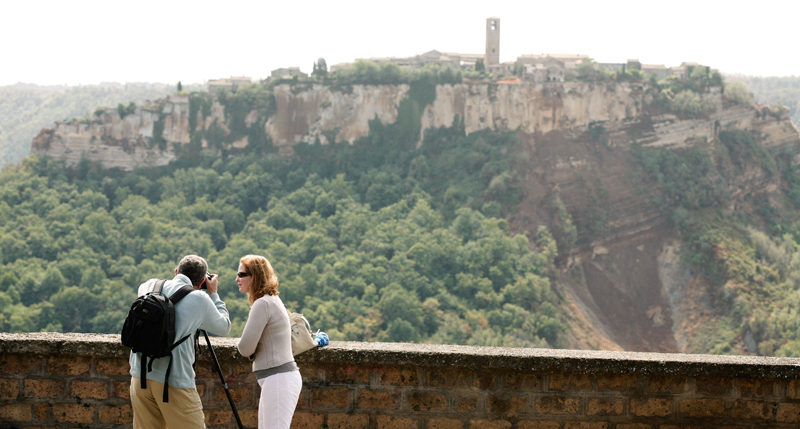 Civita di Bagnoregio is a really ancient place but sadly is now in a state of terminal decay. The tufa cliffs on which it is built are crumbling into the valley below taking houses with them. Until comparatively recently the road signs pointed to Civita, la citta che muore – the dying city. They were removed as this gloomy message appears to have discouraged tourists, but unfortunately the dying continues apace. That said, it is a supremely melancholic place to photograph. Rather like a miniature Orvieto (20 miles away) it is perched on a hill, with the most dramatic backdrop of crumbling clay ridges and ravines, with the Apennines looming in the far distance, it is rather like an Italian Monument valley. 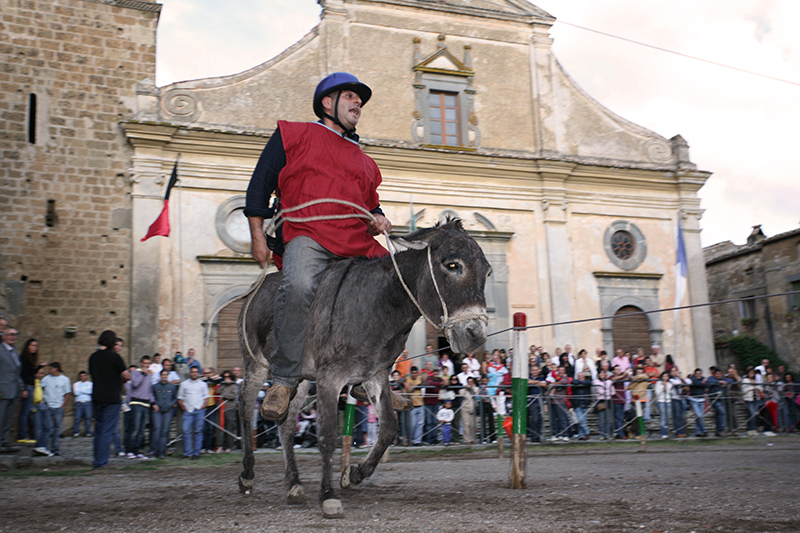 The mercifully almost un-restored church of St Donato stands on the site of an Etruscan temple, the pillars of which still front the square which in turn is unpaved and serves as a racecourse for the absolutely un-thrilling donkey-derby held twice a year. Although many of the buildings are in ruins – including the birthplace of St Bonaventura most of which has fallen over the edge – many of the old buildings around the square have been sympathetically restored and turned into weekend bolt-holes mainly for arty Romans. The film director Tornatore (Cinema Paradiso) has a house there which he uses to write his screenplays. Bagnoregio has been attacked by the Goths, bombed by the Germans, shaken by earthquakes but the worst devastation in my opinion was caused by the engineer who built the hideous new concrete bridge up to the town in 1965 – thank goodness for Photoshop – with luck maybe one day it will be replaced, but by then the rest of the town may have crumbled into the ravine.